This year I hit upon the Farmer's Market and started the Farmer's Market series. I made my own applesauce, jams and jellies and even canned sauces for the dreary winter. I am yet to post them... will do as I open them one by one. For the new year it is our hope to do more of the same. Hopefully we will continue to make simple and quick dinners and lunches, indulging our tastes, learning new recipes and making healthy food. 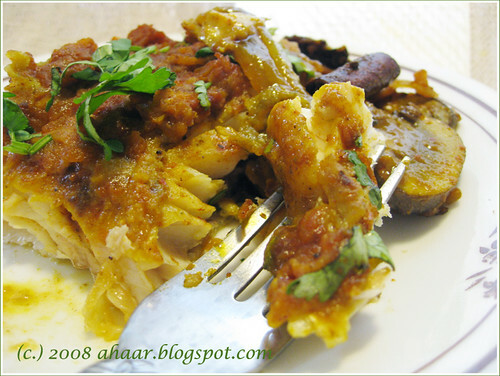 We also hope to do more with off-the-beaten-path recipes and themes (like the Thanjavur marathi series). Thank you everyone for your encouragement and continued support. safe, healthy, auspicious and happy new year. I had picked up some organic minced lamb from the Farmer's Market few weeks ago on an impulse and had no idea what to do with it. So, when I was in the Indian store a week later and saw the Shaan Shammi Kebab Masala packet, I picked it up and decided to give it a try. This was the first time trying out kebabs at home, and it came out great. The kebabs were soft and perfectly spiced too. I followed the recipe (more or less) adding just extra garam masala while cooking. We had it as a roll with salad on spinach tortilla. Yum. Boil all the ingredients (leaving out the onion, chillies, cilantro, egg) together till meat and dal is boiled. Drain the water and grind it together to a paste. Take care to drain the water properly. 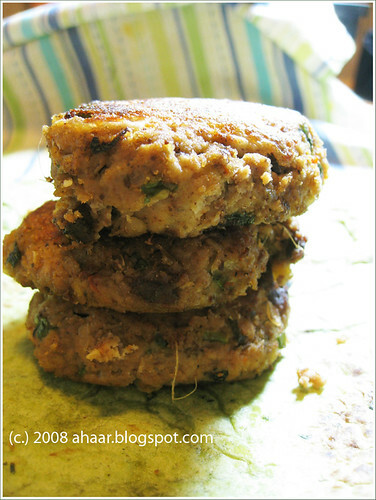 If there is water left in the mix, it will make it hard to make kebabs as it becomes too soft and crumbly. Heat a thick bottomed pan and add some oil. Now add the chopped onions, cilantro and mix it well. Take a small amount of the mix (about small scoop of ice-cream) in the palm of your hand and flatter it slowly to make kebab. Dip it in the egg wash and fry till each side is golden brown. Serve warm. Enjoy it as a starter, as a side dish for dinner or as the main course. The weather has been freezing the past week, not to mention the big snow storm that hit on Friday. In this weather, when you are looking for reasons to not got out and shovel the snow, doing a television series marathon seems the perfect excuse. We have been watching "The Wire" and these appetizer bites kept us glued to the television screen. I picked up the puff pastry sheet at Trader Joe's and created a variety of toppings. I have made it a few times now with meat, mushrooms, jam, applesauce, color bell peppers etc - and have received good feedback from everyone. Garnish - You can garnish with variety of herbs. For this round, I used cilantro. This is the simple part. Preheat the oven to 400 degF. 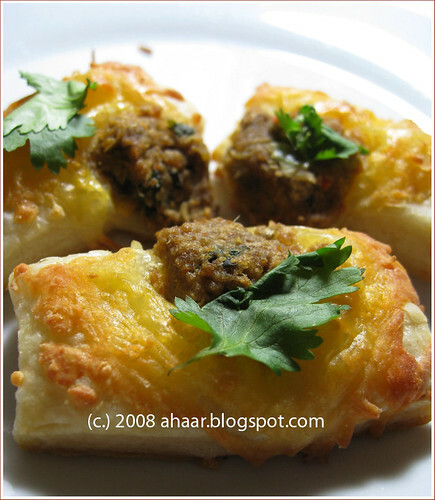 Cut the puff pastry to bite size pieces and layer each piece individually with cheese and meat. Bake for 15 minutes and serve warm. 'Tis the season, as the semester ends, to get together, eat and enjoy friends company. We had friends over during the weekend and I made some pizza, soup with a big bowl of salad. The pizza is over, but we had some soup leftover which we enjoyed with our dinner today. This is a mix of carrot, potato and onion soup and the ratio is 4:2:1. So for 4 carrots, you put two potatoes (half of carrots) and one onion (half of potatoes). 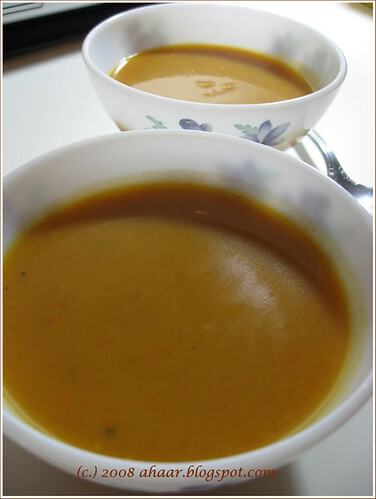 The soup is spicy with garam masala, cumin, and ginger garlic. The best part is there is no cream added, yet this is thick and creamy and the spices cut the sweetness of the carrots well. This is perfect for that movie/tv series marathon you've been planning, or just relaxing on a snowy day. I like to mix in my spices when I am boiling the vegetables so they mix well together. Clean and cut the vegetables and cut in big cubes. Boil them together with the spices. Once boiled and tender, puree in batches. Put it in a big pot and simmer for a 3-4 minutes. Garnish with cilantro (optional) and serve warm with salad, pizza, or bread. 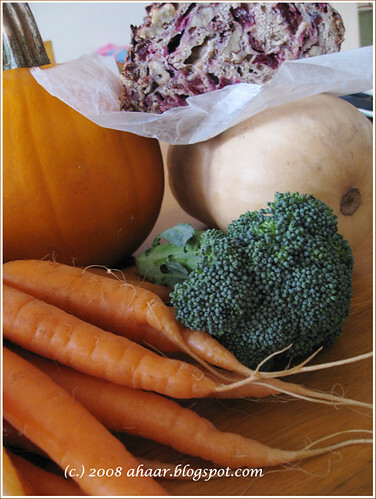 Now that the winter has come in for good, the veggies at the market have reduced dramatically. This time when I went in, several of the vendors were gone and only a few were selling veggies. But there were several vendors with beautiful arrangements and wreaths and I spent a lot of time looking through them. It's been a while since I posted last. The truth is that the Mumbai blasts really shook me and I couldn't bring myself to do anything else. We were glued to the Internet and television as the events unfolded. We were wondering what we could do here in Ann Arbor, and got a chance to attend a vigil at University of Michigan Diag two days ago. Despite the bitter cold, about 200 people gathered to pay their respects and try and make sense of what seems meaningless. I feel little better now, better enough to talk about food again. 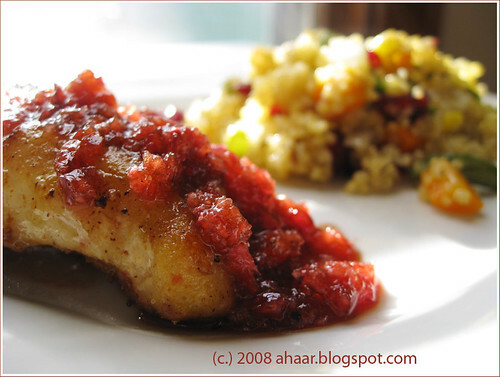 So let me share this catfish fry with cranberry relish recipe with you all. We went to a friend's place for dinner and got the recipe for cranberry relish, which I tweaked to go with the fish fry. Here is how this came together. Mix all the spices in soy sauce and make a paste. Marinate the fish in the paste for 2-3 hours. Heat oil in a thick bottomed pan and shallow fry the fish 3-4 min on each side till the fish is cooked completely. Chop it all together in a mixer till you get a relish consistency, not too smooth. This is the original cranberry relish recipe. To this I added 1/2 tspoon balsamic vinegar, 1/2 tspoon virgin olive oil and fresh ground pepper. It gave a nice tang and sweetness which went really well with the simple fish fry. We had this for lunch this past weekend with quinoa pilaf. My mother and mother-in-law went back so this past week was very busy. After coming back from the airport, the house was quiet and we were not in a mood to cook. Plus, the fridge was kind of empty and it's cold outside. Soak all lentils for 30 minutes and then grind it with the spices to a smooth paste. Add the cilantro and green chillies. 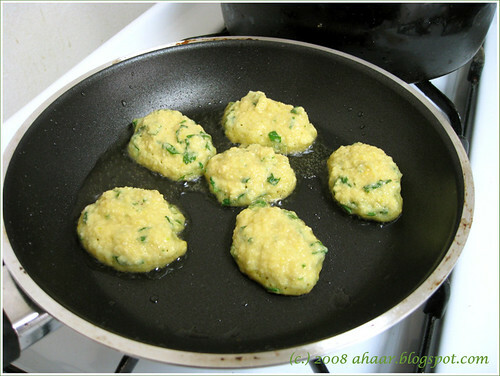 Heat oil in a pan and shallow fry the fritters till they are golden brown, turn it around and cook the other side. Serve it warm as side or with some chutney. These plate of lentil fritters are going to Suganya at Tasty Palettes who is hosting Vegan Ventures Round 2 and for My Legume Love Affair Fifth Helping being hosted by Briciole. It's become cold and we've had more than the first snowfall. So you can imagine how much I was was looking forward to the Saturday Farmer's Market. 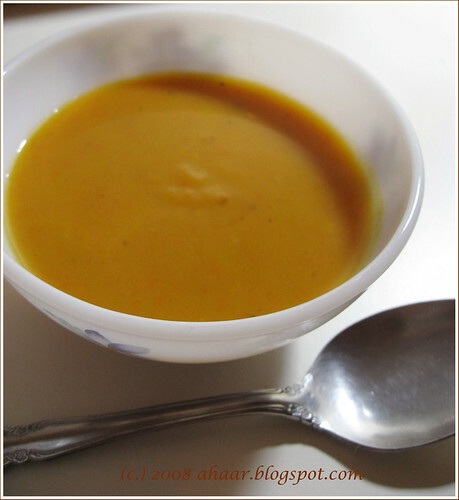 I got delicious Butternut Squash with which I made delicious soup. I also picked up cauliflower and there were cucumber. I couldn't let them pass by, so got three of them to remind me of summer :) There were some fresh daikon radish, cilantro, chives, beetroots, potatoes, tomatoes, and onions. With all the delicious veggies to cook, I was ready to face the snow for another week. 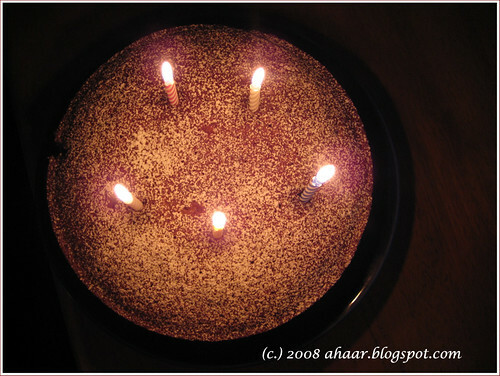 At this time of the year, I bake a cake for Aswin's birthday. I've made chocolate cake with whipped cream and black forest cake before, but this year with my theme of local eating I decided to do something simple and different. 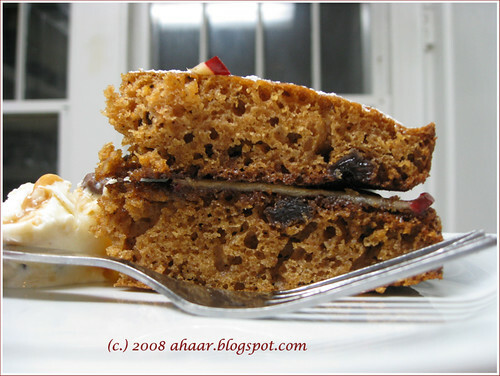 I settled on spiced applesauce cake, partly because I made three delicious bottles of homemade applesauce from apples on the tree outside (recipe coming up soon) . I looked around and settled on a recipe from Simply Recipes website. It looked easy and manageable. Preheat oven to 375°F. Butter and flour baking pan, set aside. I used two cake pans. Then mix the dry ingredients together - flour, baking soda, cinnamon, nutmeg, cloves, and salt. Set aside. Beat butter and sugar an then add the eggs one at a time till the mix is light and fluffy. Next, add the vanilla and the applesauce and beat until it's all mixed. Mix in half of the dry ingredients in to the mix. As you are mixing, add the thinned yogurt/buttermilk. Then add in the rest of the dry ingredients, until completely incorporated. Do not over-mix. Pour out the batter into the prepared cake pan. Place in the pre-heated oven and bake for 25-30 minutes, until done and the toothpick comes out clean. Remove the cake from the oven. Cook all the ingredients on low heat till it becomes thick and syrupy and the apples are soft. Let the cake cool, then add the apple mix in the middle and put the second layer on top. Garnish with powdered sugar and serve. We enjoyed ours after a lovely meal. Thanks Elise! 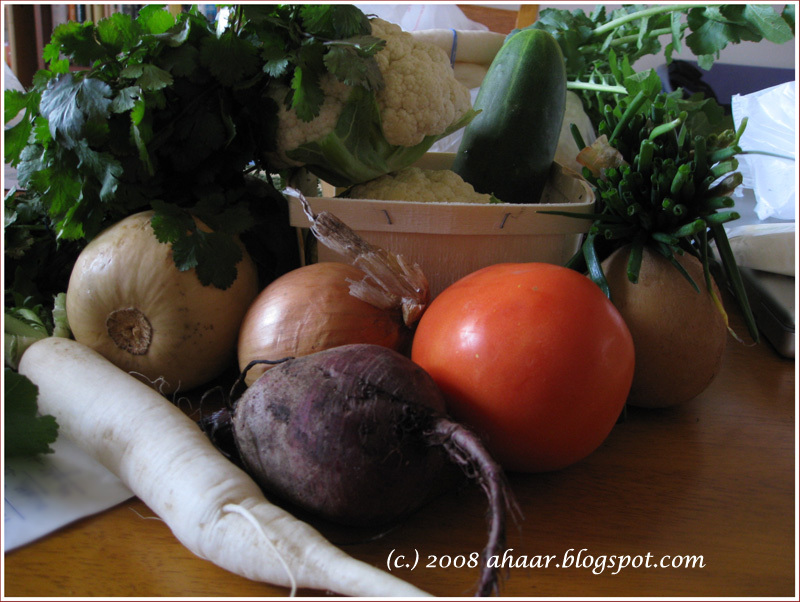 This is going to Maninas at Maninas: Food Matters who is hosting Eating with the Seasons! I haven't posted pictures in the Ann Arbor Farmer's Market series in a few weeks, but I have been making the trip every Saturday morning with my bags and my mom in tow. It takes a while finding parking because like me, it is a ritual for several other people too. The Farmer's Market series has been a lesson in eating with the seasons. 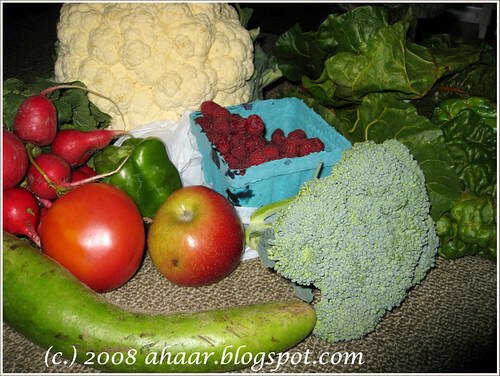 Now that Fall has set in, there is a marked change in the vegetables offered at the market and you will notice it in the two pictures I am posting. 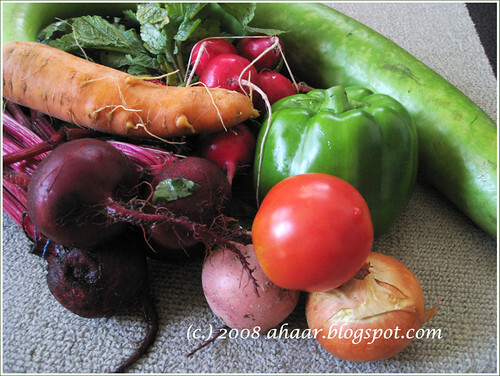 This pictures is from Farmer's Market from third week of October. As you can see that the vegetables were a mix of summer an fall with bottlegourd, red radishes and bell peppers of summer time and rainbow chards, cauliflower and apples of fall. The special was a box of raspberries. It was probably one of the last days when fresh raspberries were available. I froze half of it to use it in winter. 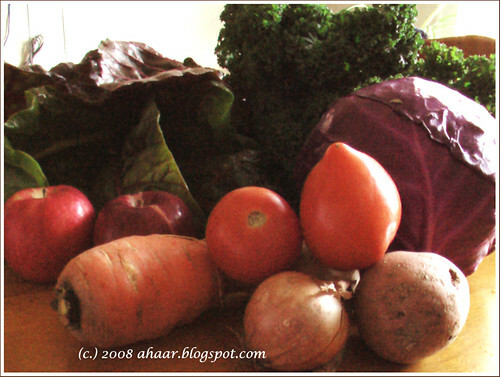 And this is a picture of the things we got from the Farmer's Market this past weekend. As you can see, gone are the cucumbers, peppers and bottlegourds. We picked up a delicious red cabbage, kale, chard, apples and some carrots. I got chatting with a Farmer and she told me that they have vegetables till December and then it starts dwindling. So I plan to continue making my Saturday morning trip till it is available. Speaking of Fall, I didn't have to go too far to find Fall colors this year. 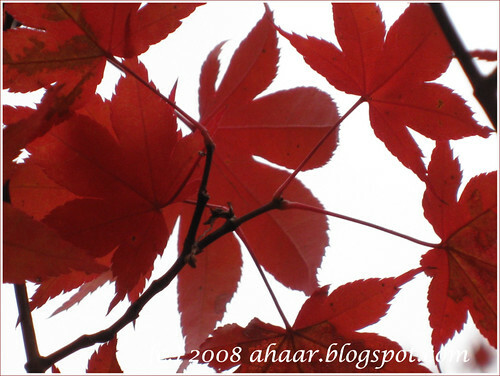 The red Maple tree in the frontyard has turned brilliant red and the other trees on the road provided the other colors. Here are a couple of pictures I took this past weekend. 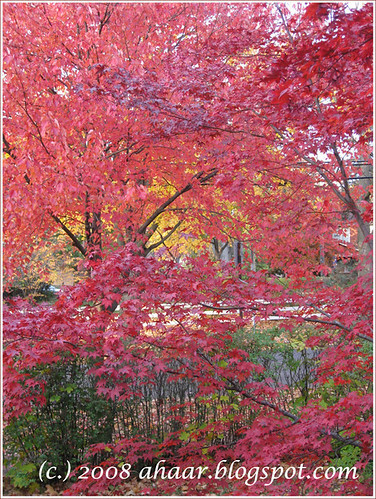 Red Maple Tree in the front yard. This is the view from my window. What a week it has been! While watching the results come in, we had a little celebration of our own with friends and the next few days were spent in euphoria and excitement. At work, on phone, on chat or casual conversation, it all revolved around the magic of Nov 4. This weekend is going to be busy continuing that celebration. But before I become too busy with that preparation, I want to tell you about this delicious fish that I made for weekday dinner. We recently saw Walleye at a local grocery store and the man at the counter pointed out that Walleye is a great lake fish that they get only sometimes. So we got a fillet and since it was so fresh, I decided to bake it with spices and vegetables. 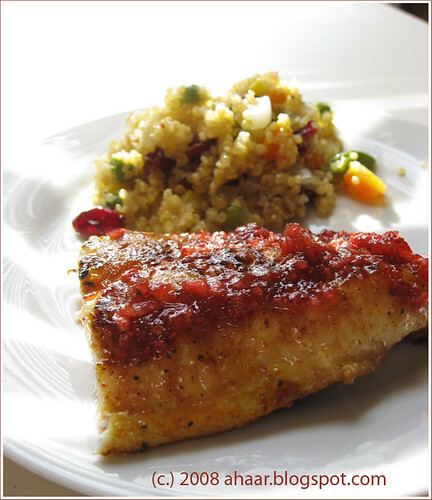 The fish was firm and flaky and it absorbed all the delicious flavors of the spices and veggies it was cooked with. You can substitute this fish with any firm white fish. Rub the fish with salt and turmeric and let it sit for 20 min. Then heat a deep bottomed pan and shallow fry the fish lightly. Set it aside. Preset the oven to 300 deg F and then saute the ginger, onion and pureed tomatoes in a pan. Then add the spices and stir in white wine and let it cook for 3-4 till it becomes a smooth sauce. Add in the mushrooms and olives and cook for another couple of minutes. 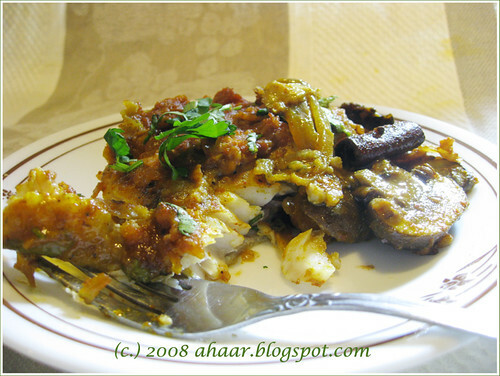 Now put the fish in baking dish spoon the sauce all over the fish and let it cook for 15-20 min till the fish is cooked. Garnish with fresh cilantro and serve warm. The weather has been fluctuating here for the last two weeks. After the gorgeous few days of fall weather, it turned cold suddenly and around the same time I got a bad bout of cough which is refusing to go away. As the week is winding down, I am craving comfort food like a bowl of hot soup and a chick flick to go with the bottle of Nyquil and Riccola. I like to saute all my ingredients and spices lightly before I put them in the slow cooker. Rub the chicken with salt and pepper and saute it in a non stick pan with 1 tspoon oil for 6-8 minutes till they start turning brown. Keep it aside. Then heat the rest of the oil and temper it with oregano, cumin seeds, clove and cinnamon. Then add the ginger and garlic and saute for a minute. Then add the onion slices and saute for another minute. Then add the carrots, beans, celery, peppers and peas and let it cook for another couple of minutes. Add all the ingredients in the slow cooker along with, cilantro, chicken pieces and chicken stock and let it cook. I put mine on slow setting (it has only 2) and by the time it was done, my kitchen was smelling wonderful. I take the garlic out, mash it with fork and mix it in the soup. 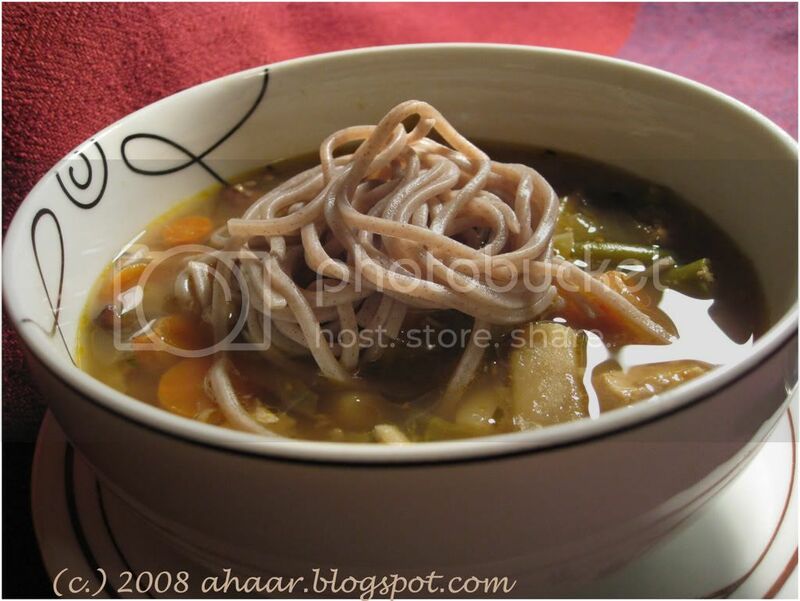 When the soup is done, boil some soba noodles and mix it with soup. Or you can enjoy it with some buttered toast. 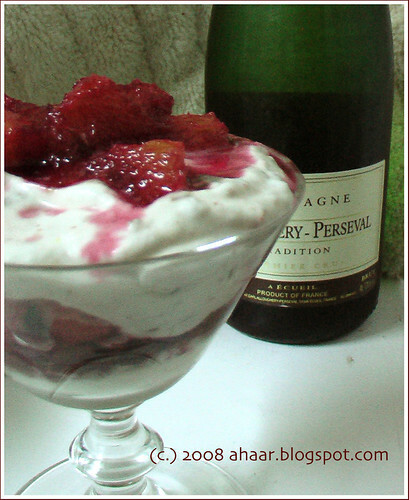 This is going to Kalyn at Kalyn's Kitchen who is celebrating third anniversary of Weekend Herb Blogging. Congratulations Kalyn! This Diwali it's homemade sandesh! 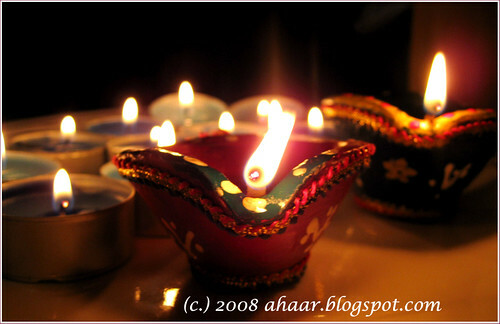 Indulge me a little bit as I tell you about choti diwali and the ritual of 14 saag and 14 baati. I grew up with this ritual - lighting 14 diyas mostly one for every entrance and doorway and eating a special Diwali dish from 14 different leafy vegetables. Fourteen signifying the 14 years of exile for Lord Rama. 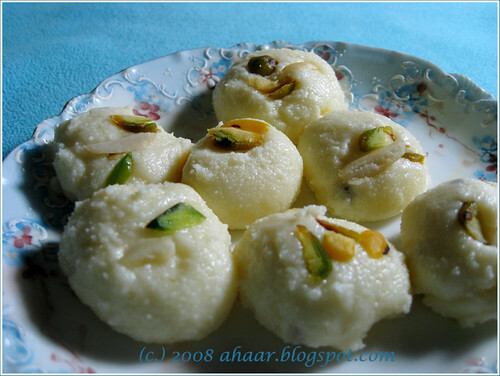 And for Diwali mithai (sweet), we made sandesh, that too from scratch. Yes, we boiled whole milk, made channa (paneer) and then made the sandesh. 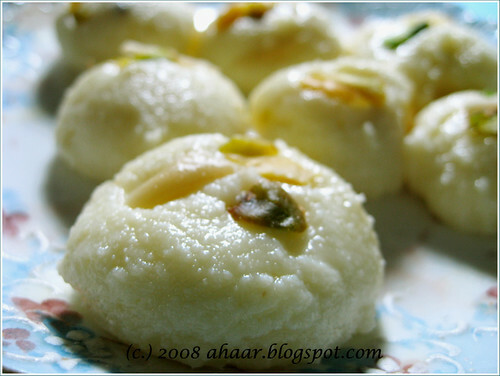 It takes time, but the end result of soft sweet, melt in your mouth sandesh is worth it. Boil the milk and add the lime juice. Put it in a cheesecloth and drain the water. Once the channa is drained, pulse is lightly in a mixer till it becomes smooth. Add an equal amount of sugar (as the channa) and mix it well. Then heat a deep bottomed and stir it constantly over low heat. The mixture will first turn liquidy and then start thickening. 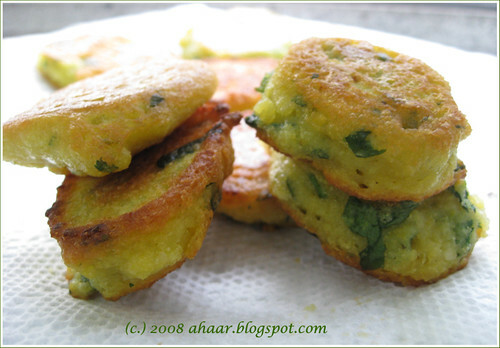 When the mixture becomes a creamy thick paste and leaves the sides of the pan, stir in the cardamom powder. 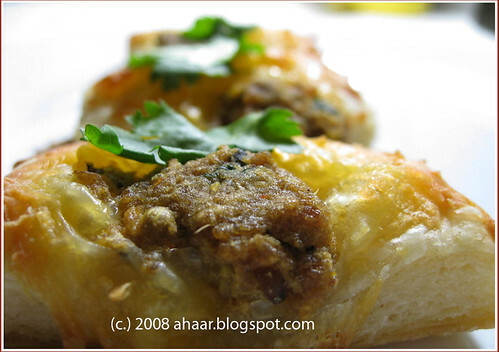 Roll it in to small balls and garnish it with pistachios and almonds. Happy Diwali to family, friends and readers. Have a joyous festival filled with happy memories. The last few months have been rediscovering the recipes I grew up eating but were pushed back to the memories folder after coming to the US. Since I never cooked in India, I got the recipes in phone calls when I really, really was craving something. But with my mom here, I have been learning how to cook and also blogging about them so that I have the recipes together for the next time she visits and I can cook it for her. 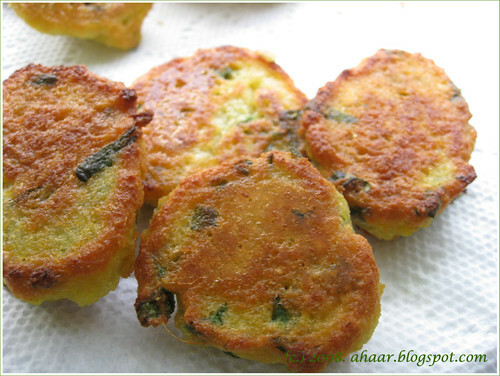 Lau moog is a simple recipe mildly flavored with panch phoron and chillies. 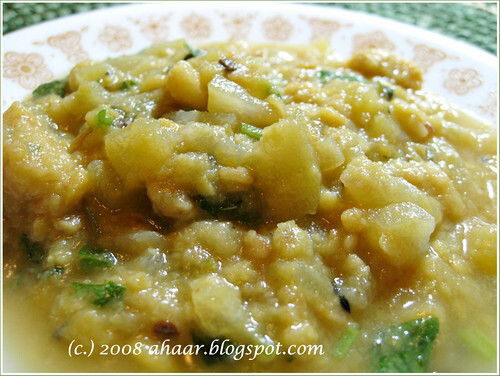 The roasted moong dal is cooked with bottlegourd but retains its individual graininess. 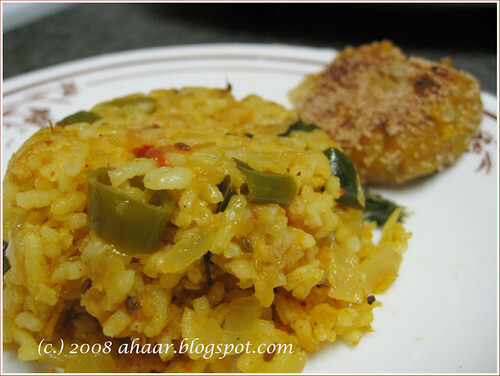 This dish is comfort food and I ate it during the summer when this light dal would cool us off. Eating it here in the Fall sunlight makes me relish it even more. The fresh cilantro gives it a zing and mixed with hot rice, I can make it an entire meal. the dal starts turning reddish brown. Remove and set it aside. Then peel the lau and cut it into small pieces. My mom calls it ghonto style. Since the lau will also release water, you will need to add less water for the dal. the chopped lau, cumin seed powder and sugar. Also add 2 slit green chilies. does not get stuck at the bottom. Heat the ghee and temper it with panch phoron, 1 red chilli, and asafoetida. Add it to the dal and mix it well together. Garnish it with cilantro and serve warm with rice. On another note, here is a picture of the last few veggies from my garden. 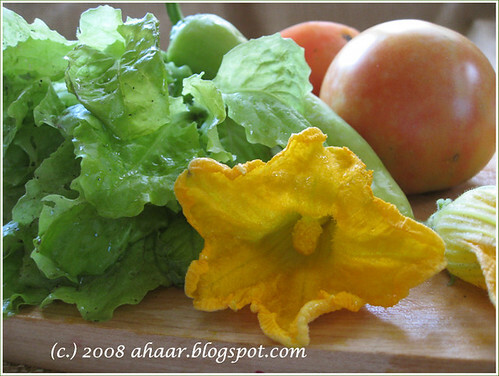 We fried the zucchini flowers and used the pepper, lettuce and tomato for a delicious fish recipe. 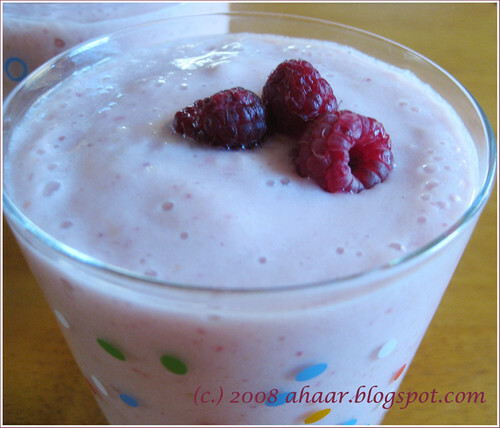 Banana, Pear & Raspberry Smoothie for a lazy weekend! What do you do for weekend breakfast when you linger in bed a little longer knowing fully well that there is a growing list of chores for every extra few minutes. This was the decision I had to make when I switched the snooze for the second time. Aswin was away, it was cold and I couldn't resist savoring the warm bed for extra few minutes, ok, for an extra hour. This is the easy part. Put everything in the blender till it becomes smooth. 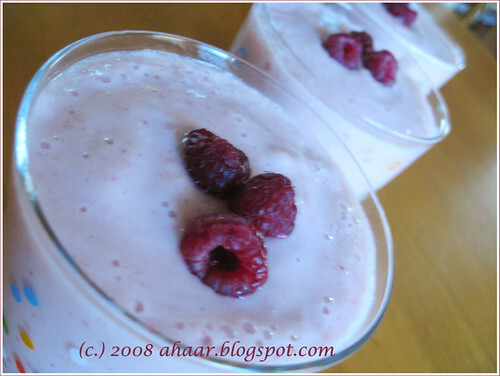 Pour in glass and garnish with fresh raspberries. After the puja, we are still in the celebratory mood. And decided to make something special to go with it :) You can say this will continue till Diwali when family gatherings are highlighted with food, sweets, and games especially Wii. We have been honing our skills to play with our niece and nephews who says we are beginners. But we are improving :) Aswin says I am a mean bowler now, while I have a difficult time defeating him in tennis. A few months ago, when our friends were visiting, we went bowling, actual bowling. Let me say I prefer Wii bowling anyday! Before I digress further, we made vegetable biryani recently. 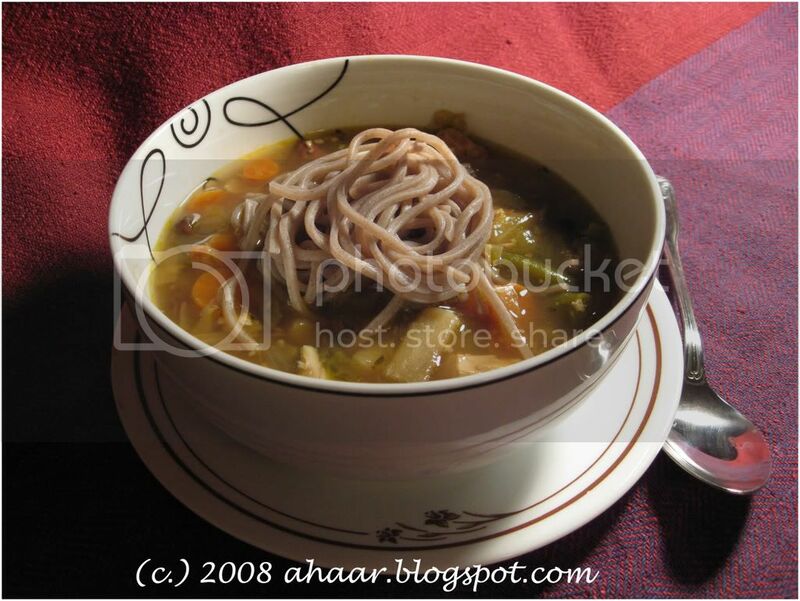 It is my mother's recipe that she got from one of our close family friends. She prepares this special water by boiling fennel seeds, garlic cloves and coriander seeds together and then boils the rice in this water. It gives such a aromatic flavor to the biryani. It's unlike what I have tasted int he restaurants. Boil the water with salt, garlic, coriander seeds and fennel seeds for 10-12 minutes or till it mixes and concentrates down to 4 1/2 cups. Take the garlic cloves out and strain the water. Keep it separate. In a thick bottomed pan, heat oil and temper it with cumin seeds and bayleaves. Then add green and black cardamom, cloves, cinnamon, black pepper and saute for a couple of minutes. Then add the onion and saute it till it starts turning translucent. Then add the rice and mix it together and let it cook for another couple of minutes. Then add the vegetables and turmeric powder. Mix it together. After that, add the specially prepared water (ratio is 2 cups water to 1 cup rice) and salt and let it cook on medium heat on closed lid till all the water evaporates and the rice is cooked. For me it takes about 18-20 minutes. Take it off the heat and mix the biryani. 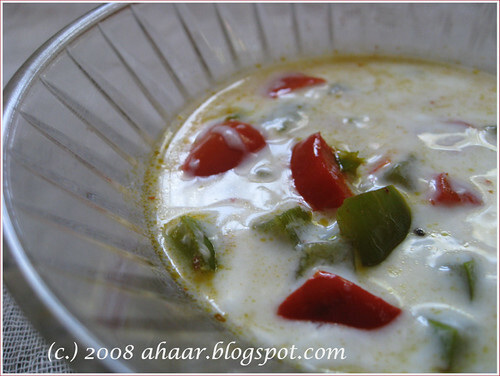 Serve warm with raita and pickle. We enjoyed ours with tomato, green chile and onion raita. 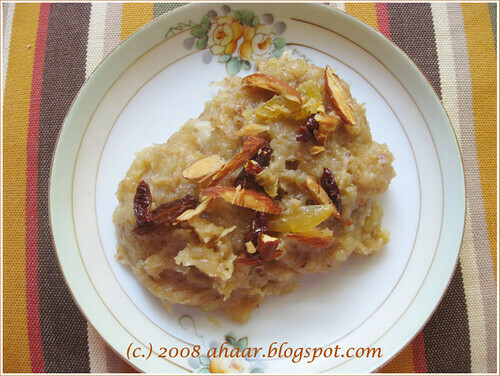 Celebrating Bijoya with Healthy Halwa! While browsing, I came across this wonderful short animation film which captures the activities and spirit of Durga Puja. Enjoy! Durga Puja is a special time for me no matter where I am. There is the nip in the air, colors, energy, excitement, time to be with friends and family. Even though I am not there to go to the puja pandal all five days, offer anjali, eat bhog, watch cultural programs and hang out with friends and family, I do try to go to the pujo wherever I am. This year it is doubly special because my mother and mother-in-law are here. There is one tablespoon of ghee for flavoring and by the time it is mixed completely and garnished with roasted nuts and raisins it tastes and smells absolutely fabulous. Here is how we made it. Boil the milk and keep it aside. When it's lukewarm, soak the bread in it. Then add mashed potatoes, boiled dal and sugar and mix it together. Heat 1 tbspoon ghee in a thick bottomed pan and then add the mixture in it and stir it together on low heat till the halwa starts leaving the sides of the pan. It takes a good amount of stirring to mix it all together. Heat the rest of the ghee in a small pan and roast the almonds and raisins and garnish over the halwa. It tastes best when served warm. Shubho Bijoya to fellow bloggers, family and friends. 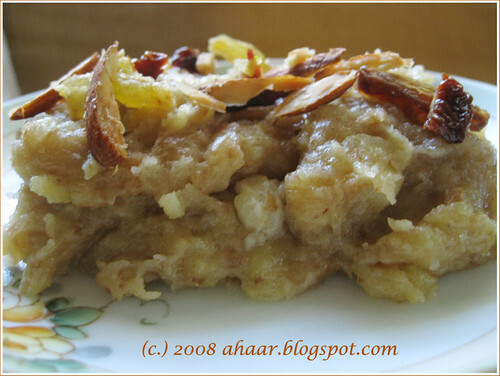 This Healthy Halwa is going to JFI:Festival Treats hosted by Srivalli at Cooking 4 All Seasons. JFI was started by Indira at Mahanandi. One of the things I admire about the Ann Arbor Farmer's Market is you can always expect people there, no matter what the weather looks like. We went once when it was pouring expecting to be one of the few people there, but it was packed. And today morning when the temperature was in upper 30s, I thought the same thing, but I was wrong. The vendors and buyers were out in full force with their vegetables, meats, maple syrup, flowers, jewelery and so much more . While writing this series, I have really enjoyed watching the changes in the vendors' wares. The summer squashes are slowly going out and winter squashes are coming in. As cauliflowers are coming in, okra is diminishing. Eating with the season has been a lot of fun. And I can't wait to see what I will find next. Celebrating Fall with Apple Rice! One of the unexpected advantages of moving to the new place has been an apple tree in front of the house. For the first few days we were debating if it was edible. But it wasn't too long before we bit into one of them. These green apples are tart and sour with hints of sweetness. But never sweet enough to eat it plain. Almost each branch of the tree has been laden with fruit and we began thinking of ways to use these apples. It was then my mother in law decided to make apple rice. We weren't sure how it would turn out. Will it be mushy? or will it make the rice too sour? With all these questions, we decided to give it a try. 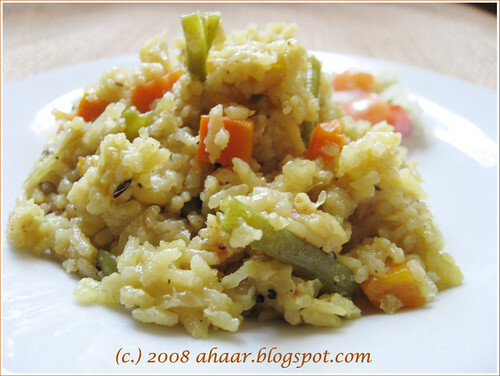 In fact, the apple rice was delicious and flavorful. With the sweet and sour notes of apple mixed with crunchy cumin seeds, curry leaves and green chiles and basmati rice, it made a delicious lunch with raw banana cutlets. Soak the rice and keep it aside. Soak the grated apples in lemon juice Microwave the apples for 3-4 minutes till it is semi cooked. Then heat oil in saucepan and temper it with cumin seeds, mustard seeds, urad dal, green chiles, grated ginger and curry leaves. Then add the onions and saute it for a couple of minutes. Next, add the tomatoes and cook it on medium heat till it turns soft. Add grated apples now and saute it for a couple of minutes. Then add the turmeric powder, cumin seeds powder, coriander powder, red chile powder and salt mixing it well with the apples. Then add the rice and mix it for another couple of minutes. Add the 2 cup water (water is double the rice) and let it all cook together closed lid on medium heat for 15-20 minutes till the rice is completely cooked and the water has evaporated completely. 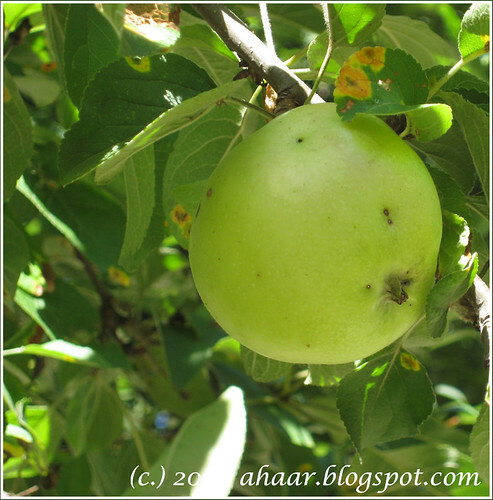 This homemade apple recipe is an entry for Grow Your Own hosted this month by Chez Us. This is going to Scott at Real Epicurean who is hosting ITB September: Fruits and Nuts. When I mentioned to the mothers that I want to post recipes from this dinner, they both expressed surprise. "This, but this is regular dinner!" It is exactly for this reason that I want to blog about this. But I can tell you this, it was great. A simple dinner after a long day is relaxing and calming. I have not had a dal like this in so long. I had this growing up all the time and used to be a favorite. Eating this brought back memories, almost in the same vein as Ratatouille critic's reaction ;) The lightness of the masoor dal combined with the caramelized onion, sweet tomato, the spiciness from ginger and green chile and the freshness of cilantro made this dal hearty and a great comfort food. It was so good, I took some to work the next day to drink as quick soup. 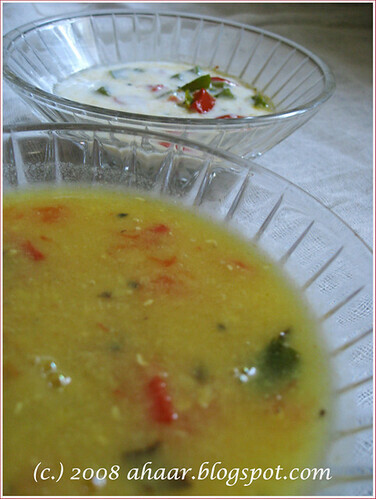 The raita on the other hand had the great pepper taste and the combination of red and green pepper made this delicious side dish with the sabzi and dal. 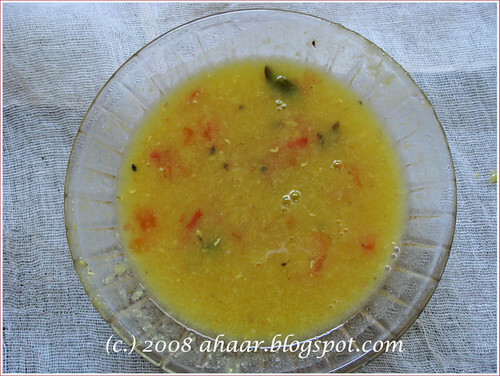 Boil the dal with salt and turmeric powder. 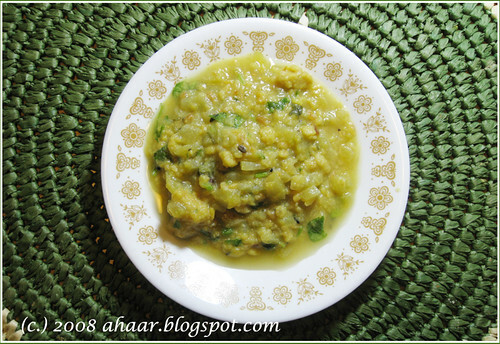 In a saucepan, heat oil and temper it with panch phoron, green chiles, and grated ginger. Saute and then add onion. Saute it for a couple of minutes. Then add tomatoes and let it cook till it turns soft. Add the boiled dal and let it cook together for another 4-5 minutes. Garnish it with cilantro and serve warm. Heat oil in a pan and temper it with all the masala. Then add the peppers in and let it cook with closed lid till they turn soft. I like it a little crunchy so we semi-cooked it. Take it off the heat and cool. Beat the yogurt (add 1 -2 tbspoon water if needed) till it becomes smooth. Add the peppers, mix well and serve. When my parents came this summer, along with homemade several delicious goodies like laddus, pickles, masalas, also got some organic cracked wheat handmilled by our neighbor. Of course daliya or porridge was a regular choice, but I decided to broaden my horizon and look for other innovative recipes. 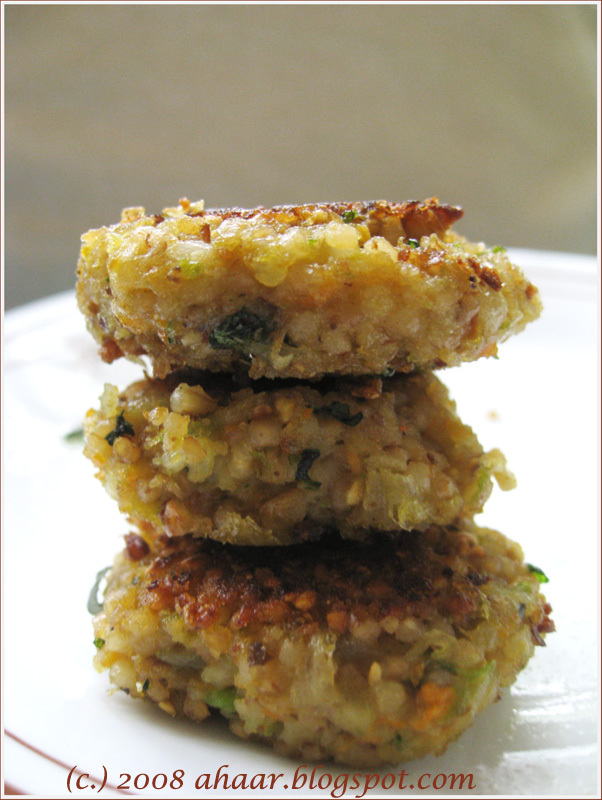 That's when my mother-in-law mentioned Cracked Wheat Vegetable Cutlets from one of her cookbooks. It sounded hearty and wholesome. And we decided to give it a try. 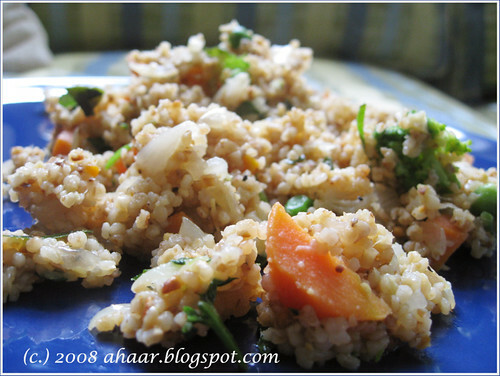 After boiling, the cracked wheat take on a pearly texture which makes it delicious and chewy. 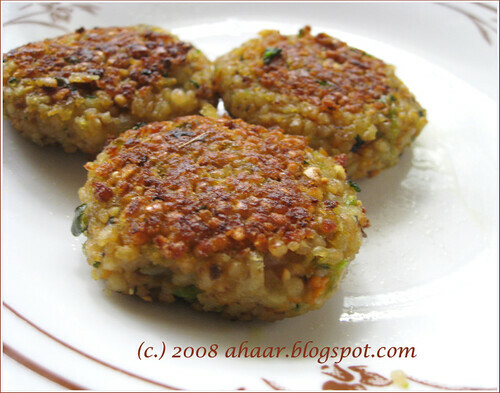 The cutlets had a crunchy exterior and the inside was nice and soft filled with delicious spices. Here is how we made it. Fry the broken wheat in a pan till you smell the wheat. Then boil it in 1/4 cup water. Add mor if needed. 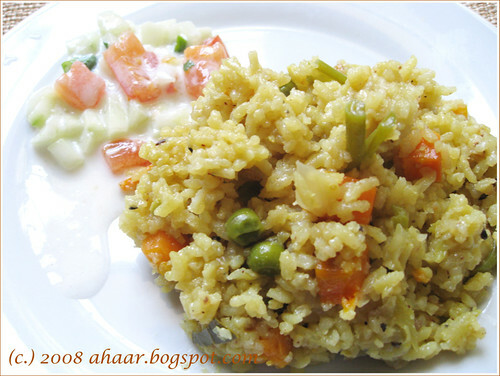 When the wheat is about half cooked, add cut vegetable, salt and let it all cook completely. Cook the mix and then mash it. In a thick bottomed pan, heat 1 tspoon oil and add ginger garlic paste and saute for a couple of minutes. Then add chopped onions, red chilli, wheat and vegetable mix, curry leaves, cilantro, chickpeas powder, garam masala and cook for 3-4 minutes till it all mixes well. 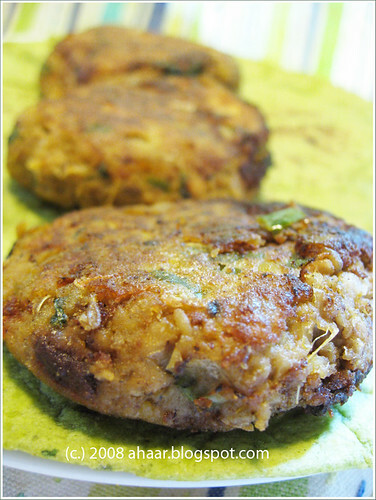 Make flat cutlets using your palms and keep it aside. Heat the rest of the oil and shallow fry the cutlets in a pan till each side becomes crisp and golden brown. Serve with chutney or ketchup. This is going to Suganya at Tasty Palettes who is hosting JFI:Whole Grains this month. What an innovative idea! Thanks for hosting. I must confess I have always been wary of this recipe. 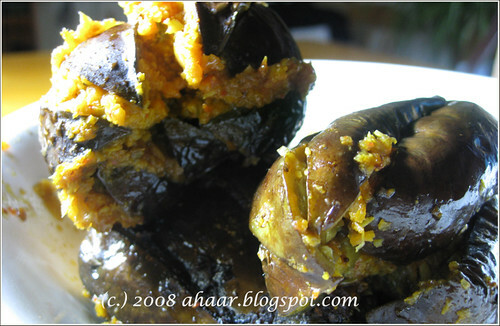 That is partly because I have heard countless times that the eggplant has to be really fresh for the recipe. Otherwise, it turns bitter. So when I found really firm, juicy baby eggplants at the Ann Arbor Farmer's Market, I couldn't resist trying it. So I requested both moms to make it :) and here it is. After I have tasted it, I have become a convert. I totally agree now that eggplants make all the difference! Slit the eggplants into four starting from the base up keeping the stem intact. Grind all the masala together with curry leaves and salt without adding any water. Then roast the masala till it loses some of the water. Let it cool. 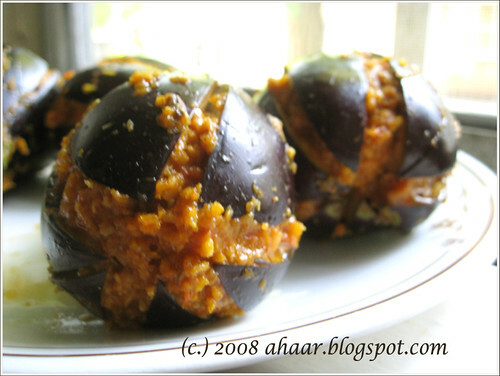 Then, stuff the eggplant with the masala. Heat oil in a thick bottomed non stick pan and add eggplants to it. Cook on low flame with closed lid till the eggplants turn tender. Open the lid every 4-5 minutes and turn the eggplants as one side gets done. Serve warm with roti, chappati or even pulao. NOTE: You may have noticed the photos have disappeared from posts. I am trying to correct the problem. I am hoping they will be back soon. My mother and my mother-in-law are visiting us these days. And the best part of it is that they both get along well in the kitchen. :) As a result we get interesting combinations for lunch and dinner. Since they both know about this food blog, our conversations inevitably revolve around food. "Do you have this recipe on your blog?" is a frequent question. They pore over recipe books and decide which recipe to try. For instance, tonight's dinner. 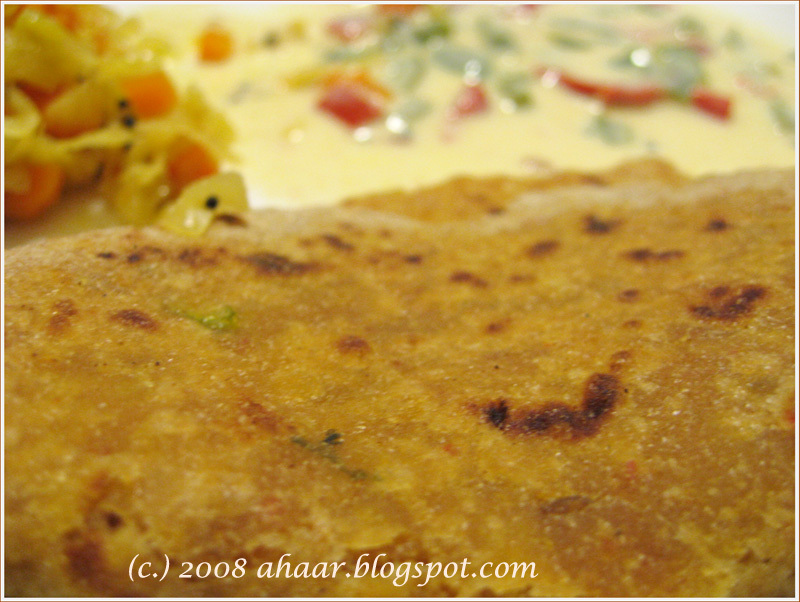 We had mooli (radish) paratha with carrot cabbage bhaji and bell pepper raita. Now who can refuse such a delicious combination! One cooked the parathas while the other made the bhaji and raita. In a pan, heat oil and add the chopped onion, ginger and green chillies. Then add the grated radish, salt and turmeric powder and let it cook till the water is absorbed a little. Then add chopped cilantro and mix it well and keep it aside to cool. In the flour add about 1 tbsp oil and slightly watery radish mix to make a soft dough. You probably won't need any extra water. Knead well and let it rest for 30 mins to 1 hour. Roll out small balls of radish dough. Roll out the dough with a rolling pin. Dust liberally with more flour as you are rolling. Heat a thick bottomed pan roast the parathas (dusting the excess flour off). Fry one side for 1 -2 minute and then turn over and brush with a little oil. When the second side is done and golden brown, flip and cook the other side. 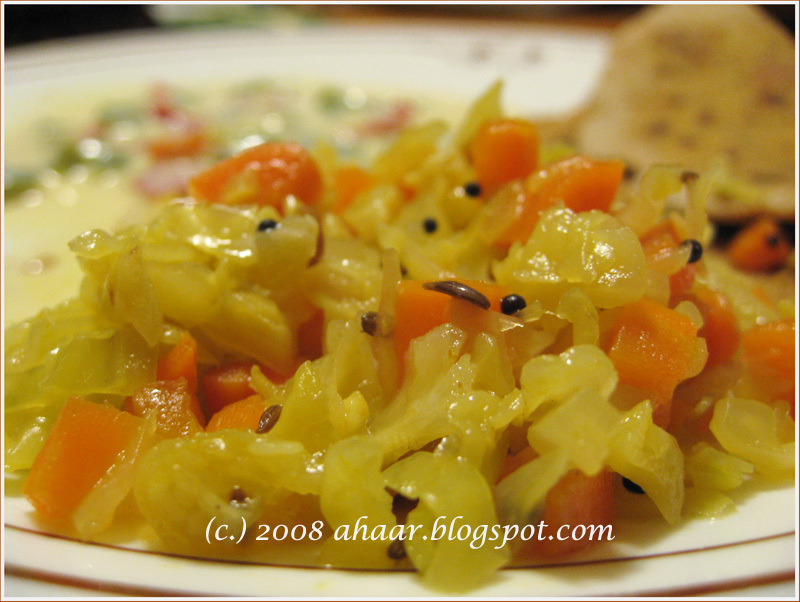 Serve with pickle and raita. Cook the carrot pieces with a little water in the microwave for 2-3 minutes. Keep it aside. 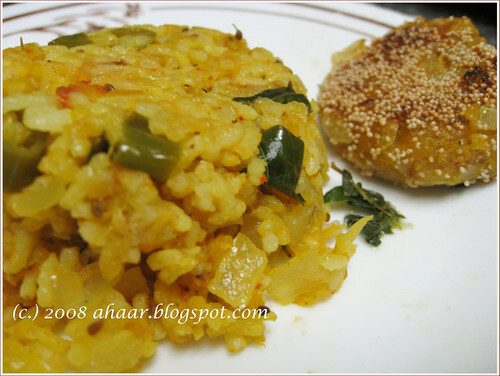 In a pan, heat oil and temper it with mustard seeds, urad dal, asafoetida, red chilli. Saute till the urad dal starts turning brown. Add the carrots and cook for a minute, before adding cabbage. Add turmeric powder and salt. Cook on medium heat on closed lid for 10-12 minutes till the cabbage and carrots are fully cooked. Serve warm with chapati or dal and rice.